Main Street Lake Cruises will be having Area Appreciation May 1st – May 5th for both the Lake Queen and Landing Princess. The Lake Queen Beach & Back Sightseeing Cruise – Adults are $10.00 with children 17 & under cruising free with a paid adult. Area appreciation is open to residents of Stone, Taney, Christian, & Greene counties as well as Boone and Carroll counties in Arkansas. Photo ID is required. Reservations must be made 24 hours in advance and tickets picked up 1 hour prior to cruise time. For more information or to make your reservation please call (417) 239-3980. Main Street Lake Cruises is located on the waterfront at Branson Landing. Saturday, May 11th, 2013 from 1 to 3 pm – Reservations are Required. Traditonal Tea Menu includes Assortment of Sandwiches, Pastries, Fruit Bread, Scones, Little Prince Tea, and Princess Tea. See brochure link below for full event details. Reserve Online or Phone 417-690-2122. TOGETHER. SHAPING THE FUTURE. ONE JOB AT A TIME. What is a champion and what role does a champion play? A champion is a volunteer mentor who is willing to enter into a relationship with one of the JfL students in which the champion helps the student reach his/her God-given potential. The champion will encourage the student during the class and maintain that support once the student is employed. Ideally, the champion and the student will develop a lifelong relationship with one another so that each will be blessed by experiencing life’s journey together. Jobs for Life orientation/information night Wednesday, April 17th at 7pm. Jesus Was Homeless is located directly across from Wal-Mart on Hwy 76 in the Vista Plaza shopping center on the backside. Please bring a friend you would love to co-mentor with or just bring yourself. 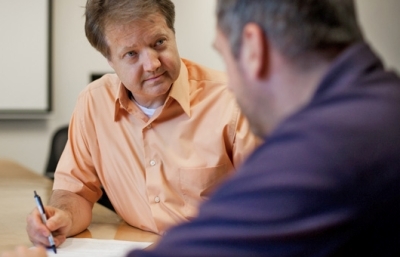 Jobs for Life classes begin Wednesday, May 1st. For more information please visit www.jesuswashomeless.org or contact Ashley Lauer at 417.337.8103 or email ashley@jesuswashomeless.org. From Monday April 8 – Thursday April 18, anyone can go to the Liberty Bank Facebook page, “Like us” and NOMINATE Jesus Was Homeless as their favorite SOUTHWEST MISSOURI CHARITY. In 350 characters or less, they can tell Liberty Bank why Jesus Was Homeless charity deserves $10,000! 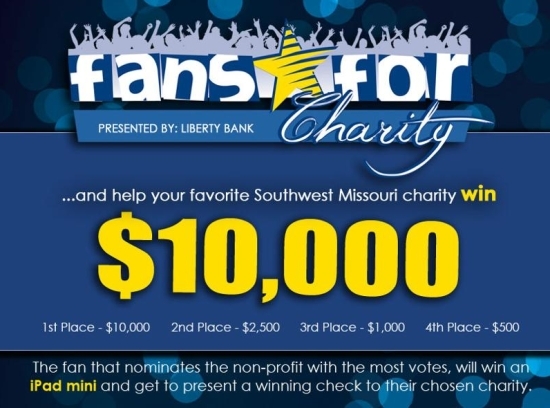 On April 19, the TOP 10 NOMINATED CHARITIES will be posted on the Liberty Bank Facebook page! From April 19-April 29, anyone can go to the Liberty Bank Facebook page, “Like us” and CAST YOUR VOTE for Jesus Was Homeless to receive the $10,000 grand prize! The top 4 charities will receive prizes. The winners will be posted on Facebook on April 30. The person who nominated the Grand Prize winner will receive an iPad mini and get to present the check to the charity! Reeds Spring, MO – April 9, 2013 – The EarthWise Recycling Center, a community-supported non-profit organization located on the Reeds Spring High School campus, will celebrate Earth Day on Saturday, April 20 by expanding their standard recycling services to include electronic waste and rechargeable battery disposal, as well as glass recycling. EarthWise—which was started last fall by the Ozark Mountain Legacy Catalyst team in Stone County—is a single-stream recycling facility, which means that all common recyclables—mixed paper, magazines and phone books, steel/tin/aluminum cans, and plastics #1-7—can be co-mingled in one container. Conveniently, recyclers do not have to sort these items prior to donation. Donated cardboard and paperboard (like cereal boxes) are baled separately and sold to help fund the operation. EarthWise is open every Saturday from 8:00 a.m. until noon. Starting April 20, EarthWise will begin accepting the following recyclable items: electronic waste such as TVs, cell phones, iPods, tape players, radios, computers, copy machines, digital cameras, etc. ; media items such as DVDs, CDs, VHS, and cassette tapes; rechargeable batteries (lead-acid batteries not accepted); glass used as food or beverage containers (please rinse). These items must be sorted separately, as they are not accepted in single-stream recycling. Donations are appreciated for handling and recycling rechargeable batteries and electronic waste. In celebration of Earth Day, all Stone County residents are invited to visit EarthWise on April 20 from 8:00 a.m. until noon and are encouraged to bring their recyclable items. EarthWise volunteers will be on hand to give tours of the facility, and local businesses and student groups will have booths set up for visitors to enjoy. EarthWise would like to thank their generous sponsors: Brokate Janitorial, GreenStick, Greenway Recycling, Republic Services, Reeds Spring High School, and Silver Dollar City. Please contact Sue Noel at 338-8108 for sponsorship opportunities or exhibitor space at the Earth Day celebration on April 20, or for more information on how to get involved with EarthWise Recycling Center. 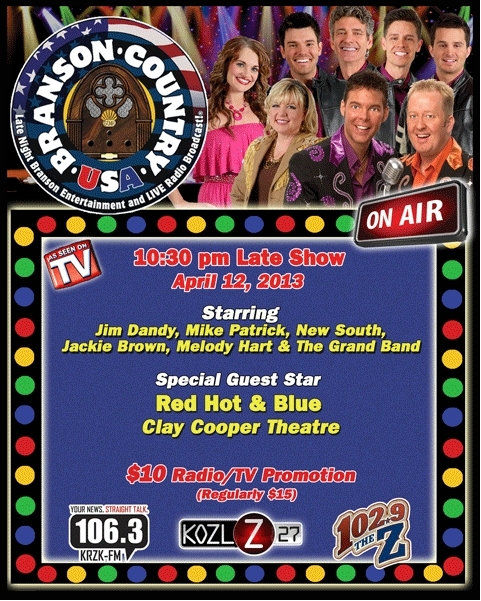 The Duttons would like to announce the re-opening of the Dutton Family Theater for the 2013 Branson Season TONIGHT! At 8pm tonight the curtains will open and we will start sharing all the surprises and songs that we have been rehearsing for the last few months and hope that you will all be there. New Julio spots (his return ticket to Spain expired so it looks like we are stuck with him for awhile), new sets, costumes, songs, bits with the kids and all kinds of things going on! This week, The Duttons will perform Monday – Friday at 8pm, then they will head off for the wilds of Wisconsin to help open a brand new performing arts center. Next week, The Duttons will be in full swing as they perform Monday – Saturday at 8pm. Also, don’t miss George Dyer! Also opening this week at the Dutton Family Theater is world renowned vocalist, George Dyer! George will open his award winning morning show on Tuesday April 9. George’s schedule this week will be Tues, Wed, and Thurs at 10am. Don’t miss it. Now for the TRUE test: Name one other organization, not in Branson, that is also having their opening day today April 8, and win a $10 gift certificate to Abby’s Tourist Trap. Email your entries to judith.dutton@gmail.com The winner will be drawn randomly from all the correct answers that we receive. Thanks everyone! We are looking forward to working with you for a GREAT 2013 BRANSON SEASON! BRANSON, MO, April 7, 2013 — What was formerly the Branson Mayors Prayer Breakfast has a new name and a new location. The annual regional prayer event will be held Thursday, May 2, 2013 beginning promptly at 6:45 a.m. and ending promptly at 8:30 a.m.
After prayerful consideration, event members of the Branson Christian Business Men’s Committee (Branson CBMC) decided to change the name from Branson Mayors Prayer Breakfast to OZARK MOUNTAIN PRAYER BREAKFAST ™. “We appreciate the mayors who have joined us in this event over the past 12 years, especially Branson Mayor Raeanne Presley who lent her support since she was elected,” stated Bill Budnick, President of Branson CBMC. “However, because we have a new location and the opportunity to reach more people, we chose to rename the event to reflect our desire to be more inclusive. In the past six to seven hundred business professionals, minister leaders, church members and community supporters have attended, according to Budnick. The new location is the Branson Convention Center in Downtown Branson. As in the past, seating is on a first-come, first-served basis, according to advanced ticket sales. Because of the underwriting of area businesses, Branson CBMC has been able to keep ticket prices comparable to previous years. Major area underwriters include: Cox Medical Center Branson, Silver Dollar City, Lilley’s Landing Resort and Marina, and Heim, Young & Associates, Friends of Jerry Lilley (in memoriam.) Individual advanced tickets are still $25 and $27.50 at the door (as available) and tables of eight may be sponsored for $185.00. The breakfast event includes a hot and hearty breakfast, inspirational songs, prayers led by local pastors and ministry leaders, the presentation of the Kingdom Builder Award, and the keynote address. This year, the keynote address will be given by Emeal (E.Z.) Zwayne, Vice-President of Living Waters, a ministry of Kirk Cameron and Ray Comfort. Set against the backdrop of Hilter’s slaughter of the Jewish people, Comfort engages especially young men and women on the streets and asks them a series of questions that often “brings them to another revelation about their opinions concerning abortion and their extra-biblical beliefs concerning God and his son Jesus Christ.,” said Comfort. Complimentary copies of the 180 movie will be given to each person in attendance at the Ozark Mountain Prayer Breakfast ™. According to Budnick, this year there will be a special emphasis on youth. Branson CBMC is encouraging all area youth groups to prayerfully consider bringing their members to the event. Budnick says he believes it is important for young people to see members of the business community who are committed to openly expressing their faith in Christ. “Our goal remains the same: to glorify our Heavenly Father and his son, Our Lord and Savior Jesus Christ, for an hour and forty-five minutes, and to join our voices with those around the nation in prayer for our regions, states, country, our elected officials and those who bravely serve in our nation’s military,” said Budnick. Tickets are available by sending checks to Branson CMBC, P.O. Box 1246, Branson, MO. A downloadable ticket order form is available at www.ozarkmountainprayerbreakfast.com. Questions may be directed to Carolyn at 417-334-6308. 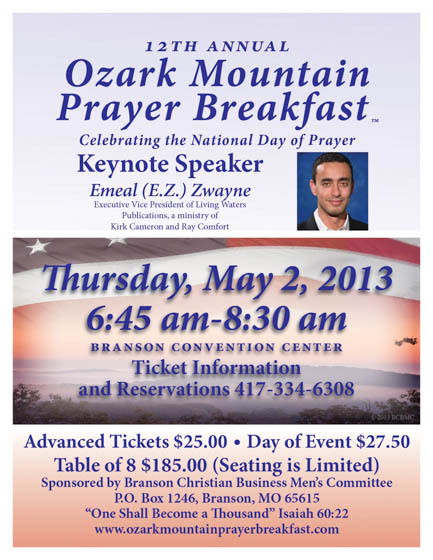 Ozark Mountain Prayer Breakfast ™ is held in celebration of the National Day of Prayer. BRANSON, MO, April 5, 2013 — “There is absolutely nothing trivial or fun about the answer to the question, ‘What is the second leading cause of death in the United States? '” said Tiffany Isnard, Director of Marketing for the Branson Tourism Center.”The answer is ‘Cancer,’ a disease that will have an impact on one out of three American families. However, a night of trivia and fun can help fight the battle against this formidable foe,” she continued. For further information on Trivia Night please call at 417-334-4400. The College of the Ozarks Ralph Foster Museum will present a Children’s Art Show April 15 through May 10 in the Edwards Art Gallery. 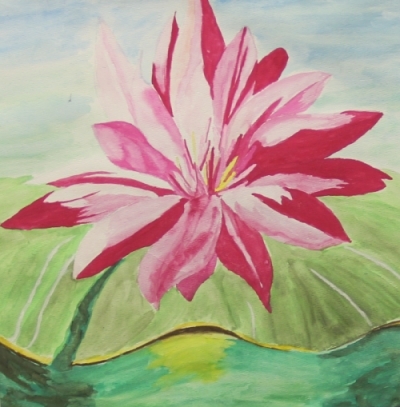 Area schools submitted art that will showcase local student talent. Family members of the students whose art work is displayed will be admitted free of charge to exclusively to view the art show. All others will be charged the regular admission price: $6 (Adults), $5 (Seniors), $4 (Veterans/Currently Enlisted), and Free (18 and under). The Ralph Foster Museum is open Mon.-Sat. from 9 a.m. to 4:30 p.m. For more information, contact the Ralph Foster Museum at 417 690-3407. College of the Ozarks will host the 2013 Work Ethic Forum: Developing a Strong Character for Your Vocation featuring FOX News Anchor Harris Faulkner on Thursday, April 11, at 7 p.m. in Jones Auditorium. Three hundred free tickets to this event are available on a first-come, first-serve basis on Monday. Individuals interested in attending, may pick up their tickets at The Keeter Center front desk on Monday, April 8, between 8 a.m.-5 p.m.
“Even though seating at this event is limited because of space, the College wants to ensure that interested community members have a chance to hear this accomplished individual speak,” said Dean of Character Education Dr. Sue Head. As a news anchor and popular radio talk show host, Mrs. Faulkner has earned six Emmy Awards for journalism, a lifetime achievement award from the state of Kansas, and degrees in mass communications and media. Raised on Army bases in the U.S. and Germany and after many years as a journalist, she has learned a key to accomplishment is accepting that change is inevitable and necessary. Mrs. Faulkner considers her latest victory joining the #1 cable news network, FOX News Channel, as an Anchor. She recently authored Breaking News: God has a Plan, in which she writes of her journey as a public figure with a deadly secret that a dangerous man was stalking her and wanted her dead. In Breaking News, Mrs. Faulkner demonstrates for readers how to turn their worst circumstances into opportunities. “Sometimes life forces us to choose excellence,” she says. After reporting and anchoring for the nationally syndicated newsmagazine “A Current Affair,” Mrs. Faulkner could be seen on CNN “Headline News” and as a fill-in host on the “Nancy Grace Show.” She also made some 50 guest appearances as a correspondent on MSNBC, COURT TV, CNBC and CNN in 2005. Seating to this ticketed event is limited; tickets will go fast and may only be acquired in person at The Keeter Center on Monday. For more information on the Work Ethic Forum featuring FOX News Anchor Harris Faulkner, please contact (417) 690-2242.